Both contenders have had illustrious careers, but each has faltered when the title came down to the final round. Valentino Rossi won his first 125cc world title in 1997 and has since gone on to take an addition eight titles, now on the verge of his tenth. Riding an Aprilia, the rider from Tavullia took the title by more than 80 points from rival Noboru Ueda. Only four times in 1997 did Rossi fail to win, just twice off the podium. His second world title would come again with Aprilia in 1999 but in the 250cc class. It was again a Japanese rider who stood as Rossi’s main rival, this time Toru Ukawa. Once more Rossi secured the title before the end of the season, this time the gap was only 60 points. During his time with Honda between 2000 and 2003 Rossi dominated. He won the last 500cc title in 2001 two races before the end of the season. His opponent was bitter rival Max Biaggi, the pair continuing their battle into the first ever season of MotoGP™ the following year. 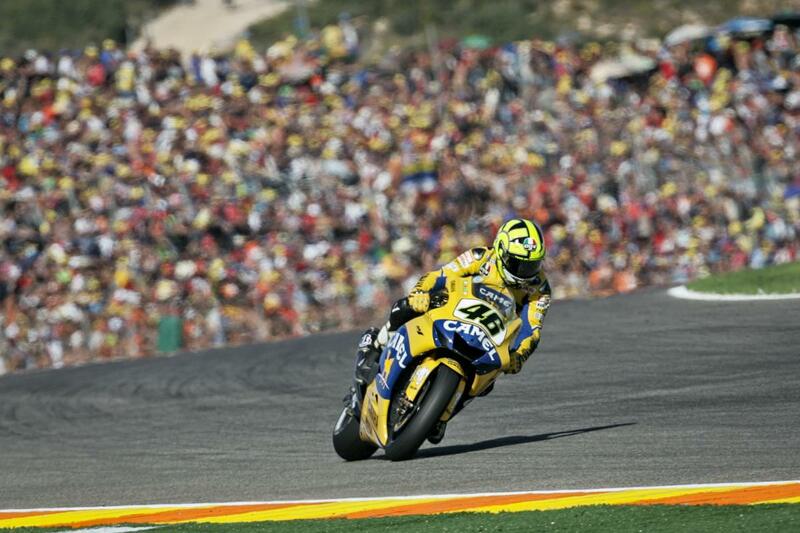 The change in bikes didn’t stop Rossi, his form evident as he won the 2002 title four races before the end. Rossi’s last MotoGP™ title with Honda came with the same apparent ease against Sete Gibernau, once more seizing the crown before the end. In 2004 came one of Rossi’s boldest moves, swapping to Yamaha who were struggling. The Italian worked his magic and achieved consecutive titles with different brands with surprising superiority to win before the last race. In 2005 came Rossi’s biggest advantage in pursuit of the title. The runner-up would be Marco Melandri, but he was over 140 points back on Rossi. In the closing years of his first run with Yamaha Rossi would be champion again in 2008 and 2009, retaking his crown from Casey Stoner and the fending off his own teammate Jorge Lorenzo for the first time. In both cases the title came before the last race. Valentino Rossi has never taken the championship in the final round of the year, but he has lost the championship. When the 2006 season came to an end, Rossi reached the closing round in Valencia with a 12-point lead over Nicky Hayden after an exhausting season in the wake of the American, the situation shifting in Rossi’s favour after Hayden fell in Portugal. However, Rossi had a disastrous outing in the final race in Valencia while Hayden escaped at the head. The rush of pressure then caused Rossi to make a fatal mistake at turn two where he fell, remounting to take 13th. With Hayden in third place, the title vanished for Rossi after succumbing to the pressures of a final battle, a fact that may grant Jorge Lorenzo confidence this year. Lorenzo also treasures a great track record in the MotoGP™ World Championship. The Spanish Movistar Yamaha rider won the MotoGP™ title in 2010 and 2012, both times against closest rival Dani Pedrosa and before the final round of the calendar. During his time in the 250cc World Championship Lorenzo took the first of his two titles in 2006, winning against Andrea Dovizioso in the last race in Valencia. Although Lorenzo suffered somewhat from the pressure during the race, fourth place was fortunately enough ahead of Dovizioso’s seventh. In 2007 Lorenzo would hold onto his crown, wrapping the title up before the final round. As with Rossi, Lorenzo has battled for the MotoGP™ title in the last race on a single occasion, opposing Marc Marquez in Valencia in 2013. The Honda rider came into the final race leading the standings by 13 points. Although Lorenzo won the race, Marquez took enough points with third, behind Pedrosa, to clinch the title by just four points. Both Rossi and Lorenzo have lost out on a MotoGP™ title in the last race on a single occasion, but for different reasons. While the pressures of the last race overwhelmed Rossi, Lorenzo did his best in 2013 and failed as he was unable to bring more riders between himself and his rival. Either could win the title on this occasion and settle their outstanding debt with the Valencia Circuit. The other, however, will have to once again endure the struggle of losing the title in the final race of the year at the Ricardo Tormo de Cheste circuit. Rossi’s last MotoGP™ title with Honda came with the same apparent ease against Sete Gibernau, once more seizing the crown before the end. In 2004 came one of Rossi’s boldest moves, swapping to Yamaha who were struggling.